Cambie Village is located on the south end of the Cambie Street bridge, in the West Side of the City of Vancouver. It spans from the foot of the bridge (West 2nd Avenue) all the way up to West King Edward Avenue. You can get to Cambie Village from Downtown either by bus or skytrain. – Take the 17 Oak going Northbound from the corner of Granville and West Georgia. Get off at the corner of West Broadway and Ash. – Take the 240 Vancouver going Eastbound from the corner of West Georgia and Burrard. Get off at the corner of Cambie and West Georgia. Transfer to the 17 Oak from the corner of Cambie and West Georgia going Southbound, and get off at the corner of West Broadway and Ash. – Take the 246 Vancouver going Eastbound from the corner of West Georgia and Burrard. Get off at the corner of Cambie and West Georgia. Transfer to the 17 Oak from the corner of Cambie and West Georgia going Southbound, and get off at the corner of West Broadway and Ash. – From the Burrard skytrain station (located at the corner of Burrard and West Georgia), get on the “Canada Line to YVR” skytrain. Get off at the “Broadway-City Hall” station. With the recent completion of the new Canada Line subway down Cambie Street, the neighbourhood has transformed into a vibrant up-and-coming spot for locals to shop, eat and socialize. The residents in this area primarily consists of young professionals and young families. Shop Cocoon (3345 Cambie Street) – This innovative retail boutique carries a trendy and stylish selection of clothing, accessories, home decor, beauty products and more! This is the place to go if you are on the hunt for that perfect gift! Lululemon Lab (511 West Broadway) Lululemon’s technically innovative lab (design and retail space) offers unique functional fashion for both men and women. Their team of designers are inspired by local and international trends, as well as feedback from athletes and guests. All of their designs are made with Lululemon’s high-quality fabrics and are exclusive to this store. My Best Friend’s Closet (3190 Cambie Street) – Boutique new and consignment fashions for women. A wide range of stylish clothing, accessories, shoes and jewelry. Here you will find brands such as Nine West, Lululemon, Anne Klein and Talula Babaton. Walrus (3408 Cambie Street) – This fun and interactive European-inspired boutique contains a mix of art and design pieces for the home, unique jewelry, whimsical ceramics and more. A must if you love design! Change of Scandinavia (2358 Cambie Street) – Boutique lingerie store with a wide selection of bras, lingerie and swimwear. Custom fittings are offered by their friendly and knowledgeable staff. Maemura Designs (3318 Cambie Street) – A wide collection of exceptional coloured stones and award-winning designs can be found at this family-opened boutique. City Square Shopping Centre (555 West 12th Avenue) – Explore over 50 shops and services in a designated Vancouver heritage building. Biercraft Bistro (3305 Cambie Street) – A comprehensive selection of Belgian and Craft beers along with a menu filled with delectable fare. Be sure to order their mussels! Tropika (2975 Cambie Street) – A favourite among locals, this multi-award winning restaurant offers quality Malaysian and Thai cuisine. Shiro Japanese (3096 Cambie Street) – Authentic Japanese restaurant that offers quality sashimi and sushi, in addition to a variety of cooked items. La Taqueria (2549 Cambie Street) – Authentic Mexican tacos made from traditional recipes with local, organic and sustainable products, when possible. Veggie options are available. Kirin Restaurant (555 West 12th Avenue)/index.php5?page=city_square – Located on the upper level of City Square Shopping Centre, Kirin offers some of the finest authentic Chinese cuisine in the city. Be sure to try their award-winning dim sum which is prepared fresh daily. Pied-a-Terre (3369 Cambie Street) – This quaint neighbourhood bistro offers refined French fare created with the freshest ingredients available. Be sure to try their 3-course Chef’s Menu at $55. Kino Cafe Flamenco Tapas Bar (3456 Cambie Street) – Popular among locals, this bustling cafe features live flamenco performances. Various music acts and stand-up comics also perform regularly on Mondays and Tuesdays. Check out the website for a schedule of events. Firewood Cafe (3004 Cambie Street) – Gourmet thin-crust pizzas are baked in an Italian wood-burning brick oven, and made with a mixture of 100% specialty mozzarella and New Zealand edam cheese. Be sure to try one of their mouth-watering pastas as well! Landmark Hot Pot House (4023 Cambie Street) – This authentic Chinese hot pot restaurant if you are looking for an interactive dining experience. For the soup base, I recommend a split pot so you can try two different stocks. Their extensive menu includes everything from marinated Kobe rib-eye to made-in-house wonton dumplings. They offer a late-night menu until 2 a.m., including salt and pepper spare ribs and tea-smoked duck. Zako’s Deli (500 West Broadway) – Authentic Montreal-style deli. Everything from Montreal smoked meat sandwiches to poutine. Try the smoked meat platter complete with a dill pickle and fresh vinagrette coleslaw. The poutine is to die for featuring fresh curd cheese brought in weekly from Vancouver Island and a vegetarian brown gravy. Benkei Ramen (3217 West Broadway) – Ramen (Japanese noodles) in a rich full-bodied broth of your choice. Simple, affordable and delicious! Perfect meal on a cold day. Mongolie Grill (467 West Broadway) – Create your own healthy stir fry and watch it being prepared right in front of your eyes! Select from a variety of ingredients including beef, chicken, tofu and a range of vegetables. Eat as much or as little as you want – you pay by weight. Great choice if you have meat eaters and vegetarians in your party. Solly’s Bagelry (368 West 7th Avenue) – Jewish family bakery and deli offering traditional Jewish baked goods and deli fare. Their bagels are boiled and baked, making them crusty on the outside and chewy on the inside. If you are looking for something sweet, make sure you try a cinnamon bun. You won’t regret it! Marble Slab Creamery (541 West Broadway) – Indulge in fresh-made gourmet ice cream, made just the way you like it. First, choose your flavour, then, choose from a wide variety of “mixins”. They have everything from graham crackers to gummy bears. Frozen yogurt is also available for the health-conscious folk. Elysian Cafe (590 West Broadway) – Enjoy a smooth espresso-based drink prepared by one of their expert baristas. Their muffins are moist and full of healthy ingredients. Lunch items are also available. Open from 7 to 7, 7 days a week. Whole Foods Market (510 West 8th Avenue) – Offering the finest natural and organic foods and natural products. They have a hot foods and salad bar, as well as a bakery and deli. A great place to go for a healthy meal on-the-go, or to buy the freshest ingredients for your culinary creation. There is also Park Theatre at 3440 Cambie Street, a historic but renovated one-screen cinema that has innovative “love seats” with fold-up armrests. During summer season, I recommend venturing up to Nat Bailey Stadium for some Minor League Baseball with the Vancouver Canadians. It is just outside of the village area at 4601 Ontario Street. Tickets are very affordable and it is an experience you won’t forget! Cambie Village has a relaxed atmosphere. You can find everything you need here – the lower portion by the bridge has a variety of big box stores, while the rest is comprised of unique, independently owned and operated stores. 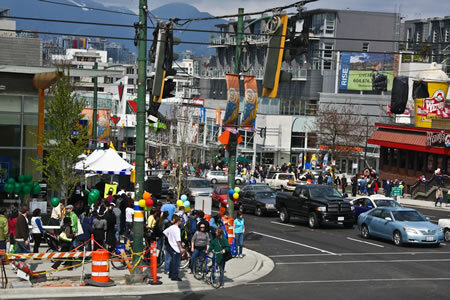 Cambie Village is a great place to walk if window shopping is your thing. If you are looking for a more natural setting, visit Queen Elizabeth Park. You can get there by taking the #15 bus from Downtown (visit www.translink.bc.ca for more info), or, if you are on a bike, both the Midtown/Ridgeway bike route, which runs along East and West 37th Avenues, and the Ontario Street bike route, running north and south, will take you to Queen Elizabeth Park. Douglas Park Community Centre (801 West 22nd Avenue) – Offering a variety of amenities, including a fitness centre, playground, pottery studio, tennis courts and a gym. Offering programs and classes for all ages. There are many young families living in this neighbourhood.